What's collaboration and how can you do it effectively? The definition of the word ‘collaboration’ refers to the action of working with someone else in order to create something or produce something. Collaboration skills enable workers to interface productively with other colleagues. Successful collaboration requires a cooperative spirit and mutual respect. 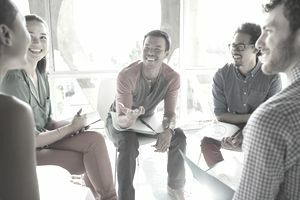 Employers typically seek employees who function effectively as part of a team and are willing to balance personal achievement with group goals. In some cases, teams that collaborate are members of the same department working on an ongoing activity that requires coordination. In other cases, interdepartmental teams are assembled to form cross-functional teams that are tasked with completing special projects within a prescribed period of time. Collaboration can also occur between many different types of partners including between bosses and subordinates. Even different companies can collaborate at times. In that case, collaboration does not always take place between members of the same company. Service providers can collaborate with clients to achieve goals, and vendors can cooperate with customers to produce products or services. Collaboration can also take place between individuals outside one's realm of employment including business partners, customers, clients, contractors, volunteers, and suppliers. Clear definitions and agreements on the roles of partners in the collaborative process. Open communication within teams to share the information necessary to carry out tasks. Consensus about goals and methods for completing projects or tasks. Don’t move forward until all members are in agreement. Recognition of, and respect for, the contribution of all collaborators. It’s important to give credit where credit is due. Identification of obstacles and addressing problems cooperatively as they occur. Teamwork is essential at all times. Group goals are placed above personal satisfaction and/or recognition. It’s crucial to put the desired project results at the forefront – this isn’t about the individual goals. Willingness to apologize for missteps and ability to forgive others for mistakes. Holding a grudge or sabotaging the efforts of other team members just can’t happen. Although collaboration is often described as a “soft skill,” in today’s workplace it is just as vital as hard skills such as one's educational background and/or technical knowledge. And, even though productive collaboration skills may not be innate to some individuals, they can easily be learned and practiced to perfection.